One peninsula, two uniquely contrasting sovereign states; Korea’s role in modern world history has been disproportionately large relative to the size of its territory and population. In the twentieth century it experienced colonial rule and military occupations, played a significant role in the Cold War and underwent the split into North and South that continues to define it today. Cuisine, Colonialism and Cold War explores the impact these political shifts had on the country’s food culture – indeed, they are shown to have been definitive in the development of what we today consider to be ‘Korean’ cuisine. 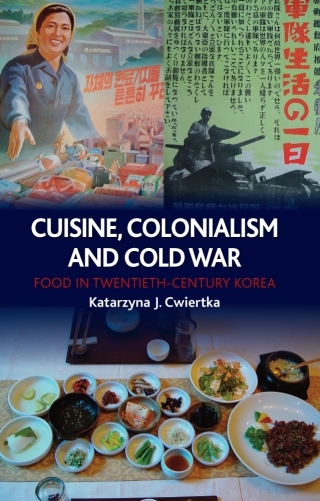 In this book, Katarzyna J. Cwiertka not only examines the socio-political circumstances that led certain ingredients, flavours and dishes to become prominent in present-day Korea but, conversely, explores the question of what these foods can tell us about Korean history itself. Seemingly trivial aspects of Korean life such as the industrial manufacture of soy sauce and the daily consumption of rice are shown to reflect the country’s historical status as a Japanese colony and its control by both U.S. and Soviet forces. The author covers a fascinating array of Korean culinary culture, from wartime food shortages and rationing through the revival of traditional royal court cuisine to the rise and success of the Korean barbecue restaurant in the West, and from the North Korean famine of the 1990s to the opening of the very first fast-food outlet there. Cuisine, Colonialism and Cold War will be of interest to food historians as well as to general readers interested in Korean food, culture and society. Katarzyna J. Cwiertka is Chair and Professor of Modern Japan Studies at Leiden University. She is the author of Modern Japanese Cuisine: Food, Power and National Identity (Reaktion, 2006) and the editor of Critical Readings on Food in East Asia (2012), Cuisine, Colonialism and Cold War: Food in Twentieth-century Korea (Reaktion, 2012) and Food and War in Mid-Twentieth-Century East Asia (2013).